Be sure to act before midnight on Tuesday, December 8th. In case you missed the original announcement, or were perplexed by yesterday's bad link (apologies, everyone), you can read all the details here. 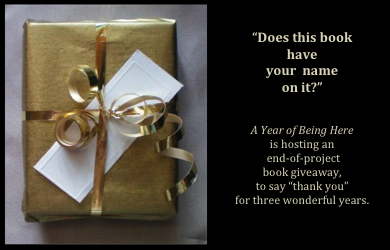 I think the book giveaway contest is such a generous and gracious way to close out the three years of "A Year of On Being Here." Thank you. You're welcome, my friend! Fun to pass along some more joy!